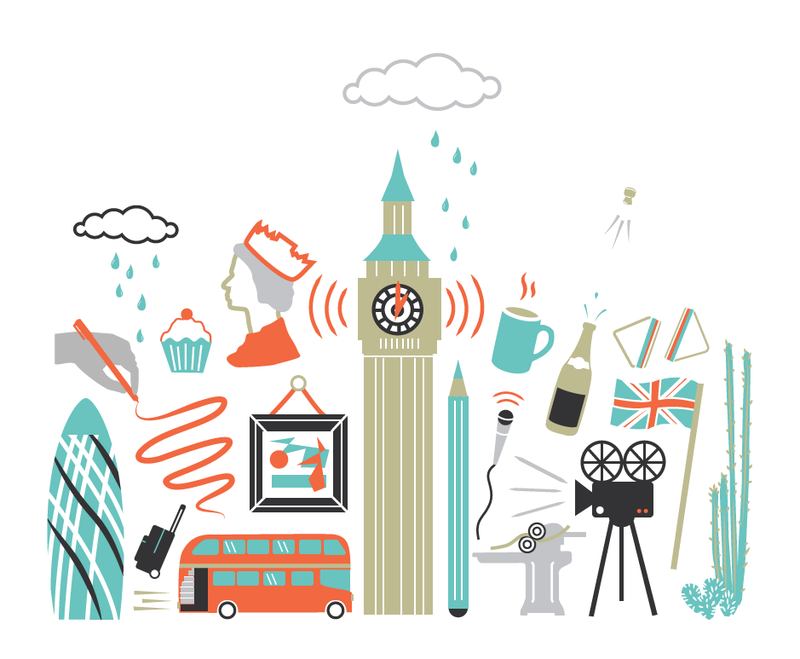 Illustrators Illustrated goes to London for Pick Me Up Festival 2015. The illustration and graphic arts scene in London appears almost as hectic and diverse as the city itself. 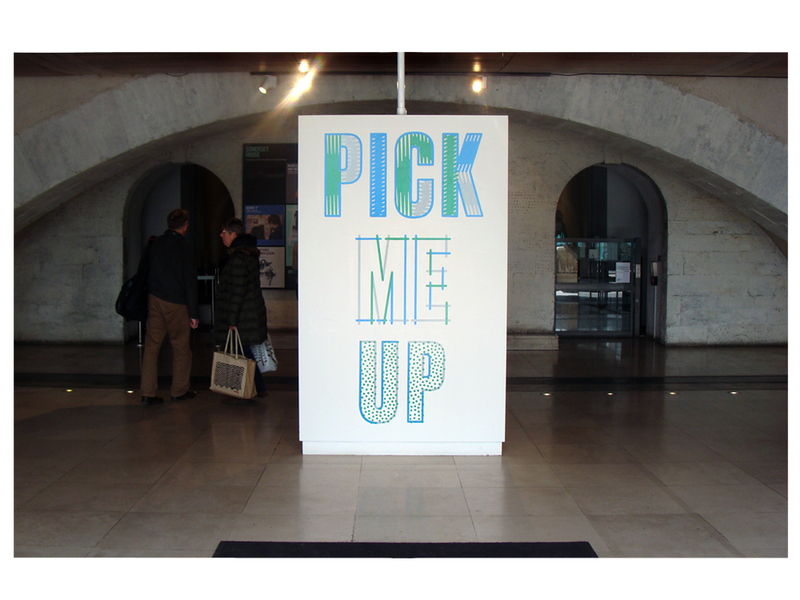 Situated on the bank of the busy River Thames, Somerset House was the grand location for the 6th incarnation of PICK ME UP, a two-week festival of illustration and graphic arts held in late April and early May. Featuring international illustrators, studios, collectives and galleries and a public programme of talks and presentations, the festival boisterously took over two-and-a-half floors in the southern wing of the former palace. On the ground floor was Pick Me Up Selects, an exhibition of works by 12 individual artists selected by a jury of industry experts and the Somerset House editorial team. 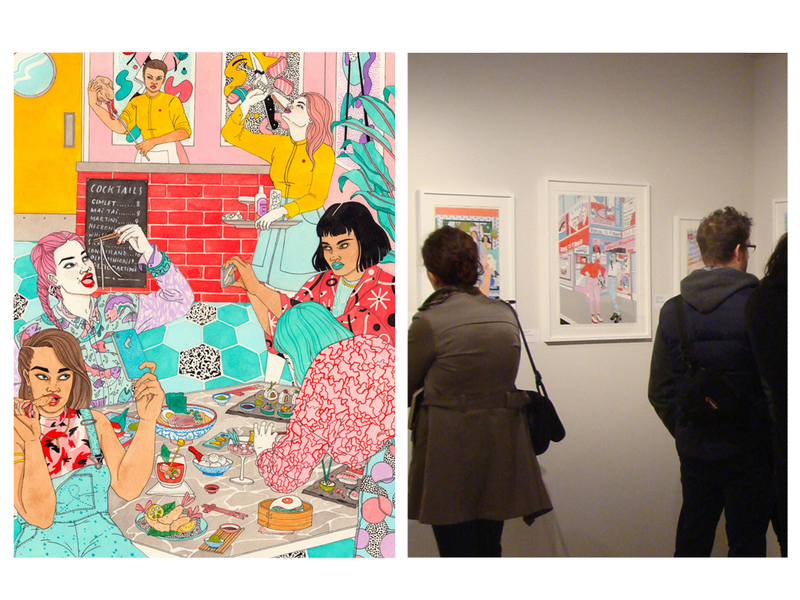 Colourful illustrations in sleek frames were spot-lit on crisp white walls. Some of the work was newly created for the festival, and cheaper limited-edition prints or the unique works were available to purchase. 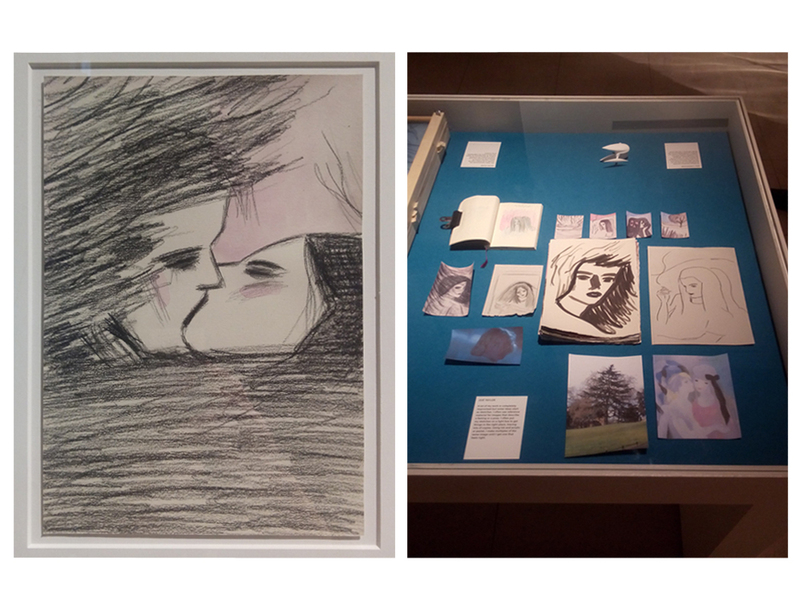 Display cases filled with objects, workbooks and draft drawings gave insight into the artists’ processes – the curatorial focus of this year’s festival. Laura Callaghan‘s meticulously planned and executed illustrations had an unapologetic ’80s look yet due to their contemporary subject matter did not feel dated. Laura presented a modern take on the nine circles of hell described in Dante’s Inferno, and represented diverse women in a variety of situations, from eating sushi to painting toenails. Her works were bubbly, full of personality, and aesthetically well considered. The animations by Jack Cunningham were pure delight. 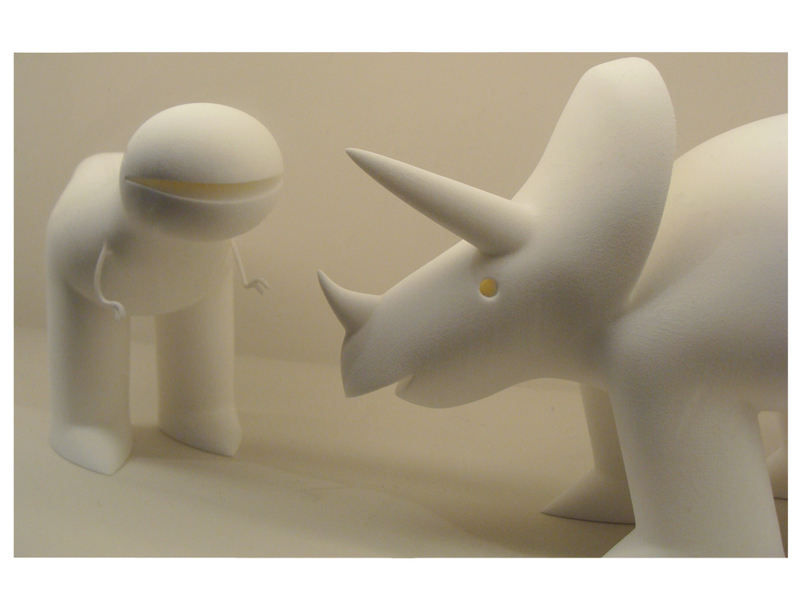 His space also included a large-scale line drawing, and carefully sanded 3D-printed dinosaurs, showing a sense of playfulness and satisfying simplicity. Zoë Taylor‘s paintings and drawings were disarmingly simple and yet beguiling. Each image felt like a quiet moment with an untold story simmering below the surface. The longer you look at them, the more you are drawn into their possibility. Depth of concept was not as apparent in a number of the other artists’ presentations and perhaps this was a product of the curatorial focus on process – or the artists’ interpretation of it. Once you understood the way the works were made, their finished work just presented different visual outcomes of the same idea. Another issue was that some artists appeared to present idealised versions of their working processes. One workbook displayed a clever, stylish and ‘designed’ workbook page, but the rest of the workbook seemed barely used. In comparison, Hattie Newman’s workbook included lists of daily tasks, like ‘bank a cheque’. This allowed the viewer real insight into the way freelance illustrators must be their own office managers and accountants alongside their creative work. 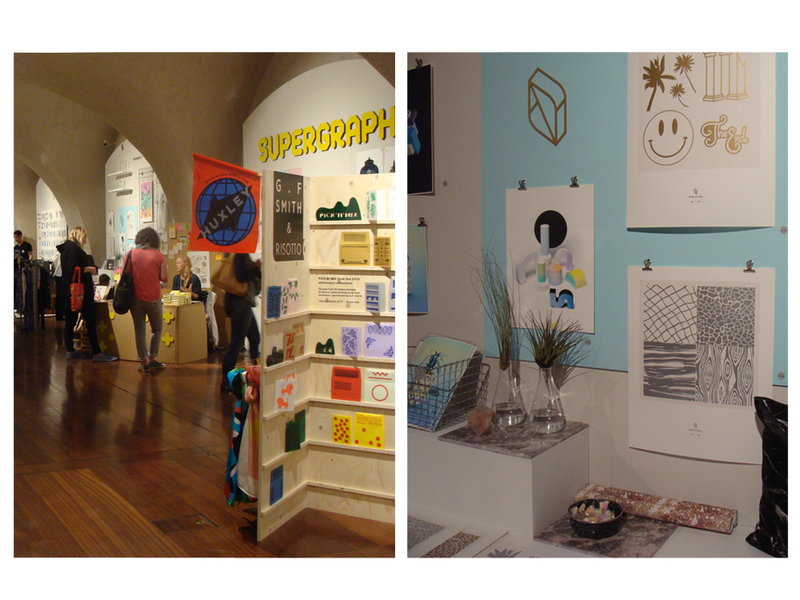 16 artist collectives, galleries and studios spread their wares over the next one-and-a-half floors. Under huge arched ceilings, their bright and specially decorated spaces showed prints, drawings, books, letter-press, ceramics and other desirable objects, showcasing their techniques and processes as well as the diverse opportunities for illustration. Lurking among plants in a darkened corner-room was Moth Collective, a London-based animation studio. Their polished work was impressive in the variety of styles and approaches, as well as having interesting socially-engaged content through their work with a number of NGOs and charities. At the opposite end of the wing, Hato‘s space was filled floor-to-ceiling with multicoloured books, prints and special objects. Hato brought together the print production, design and digital production aspects of their collective through a public program of workshops. 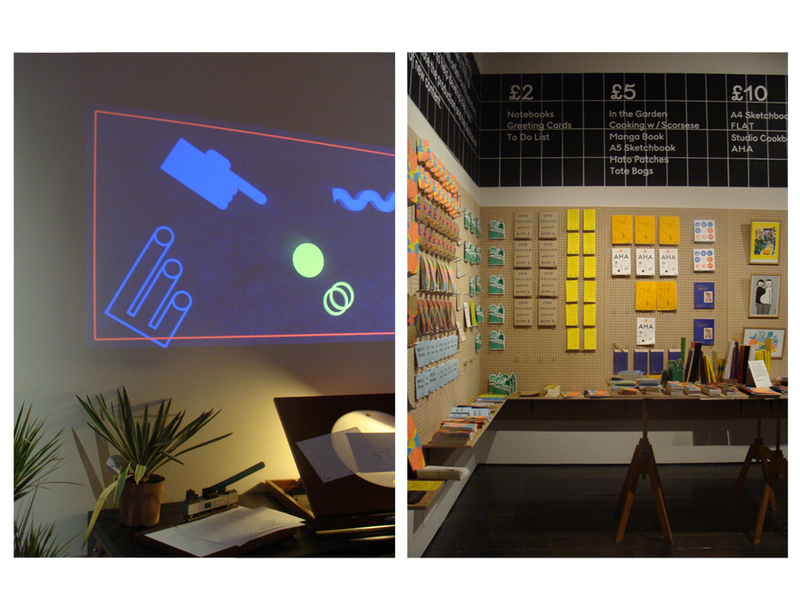 You could try Risograph printing, bookbinding, typeface design or take a Korean cooking lesson. It was a smart, hands-on way to understand the varied techniques they use in their work. Left: Detail of the Moth Collective space. Right: Detail of the Hato space. Even though the festival brought together international participants, the artist collective section had a feeling of sameness and trendiness. Maybe this came down to the artists needing to produce work affordably in order to make money on their work? Much of the work was produced through cheap and trendy printing techniques like Riso, resulting in work with a similar, decorative feel. Perhaps it was popularly accessible and sellable, but it was not challenging. Pick Me Up Platform was a new addition to PMU. Daily film screenings, short talks and longer presentations by the selected artists and leading figures in the industry added much-needed context to the festival. Talks about research, magazines, design activism and illustration journalism meant that PMU became more than a selling fair for the artists. It gave the public an opportunity to learn or ask questions. For industry professionals it was a chance to connect outside of a commercial context. 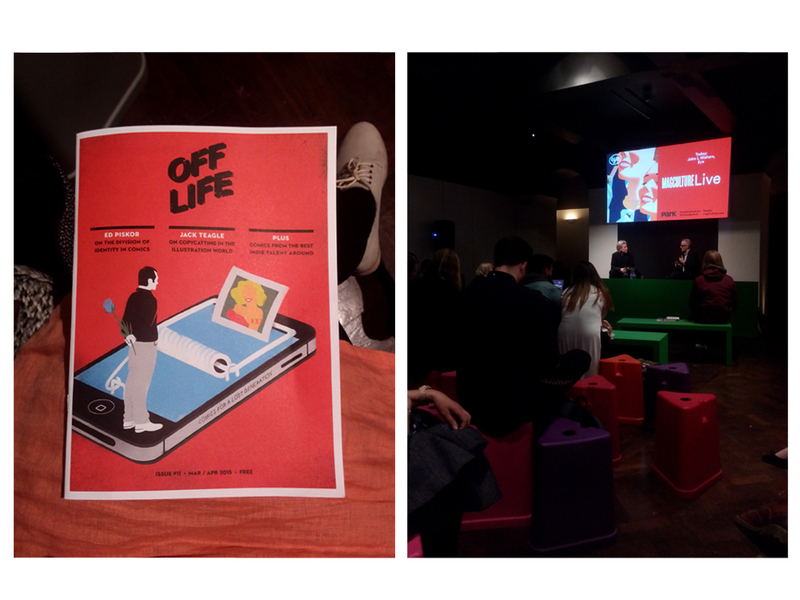 Talks by OFF LIFE editor Daniel Humphry, and Eye Magazine editor John L Walters. There is clearly a hunger for more events that focus on illustration and graphic arts. On weekends and late nights visitors queued for entrance. Once in you had to slowly shuffle through the crowded spaces. Provided with the rare opportunity to engage directly with the public, all of the artists seemed eager to talk about their work. In this way, PMU was an invaluable event for giving visibility to illustrators. What seemed to be missing was more of a voice from the organising team. Given the focus on ‘process’ I would have liked to have seen some critical writing from the jurors about the curatorial framework for selecting the artists and collectives; how they developed this year’s festival; and their views on the current situation of illustration. For more information see the PICK ME UP website.